Looking for big fish and lots of them? Want to bring home the catch of a lifetime? 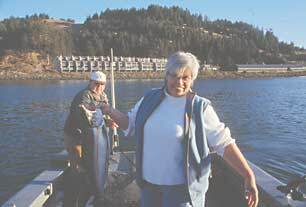 Come to Oregon this summer, where coastal waters and bays are teeming with salmon weighing 30, 40 and even 50 pounds! Some of the best salmon and steelhead fishing on the west coast is right here in Oregon, and the upcoming season is looking good. Remember, world records are made to be broken--just ask the Oregon angler about the 71-pounder caught on a fly a couple years back. That's what salmon fishing is all about in Oregon. Bring your own boat and equipment or enjoy a guided charter with everything supplied. Pick a coastal river of head out into the ocean. Oregon's coastal communities have many top-notch charter fishing boats, expert fishing guides, and friendly, helpful businesses and visitor centers to help make your fishing trip the best ever. The Oregon Coast Visitors Association(OCVA) has compiled a list of charter fishing operations that are ready to take you to where the fishing is! If you've fished your limit and still want more, you can find fresh-from-the-sea specialties like Oregon troll-caught salmon, halibut, tuna, an rockfish at local seafood dealers and markets. You can also buy direct from fishing boats in ports up and down the Oregon Coast. On the Oregon Coast, we even help you take your fish home. No matter how far away you live, it's easy to take some of the fresh flavor of Oregon home with you. Just take your catch -- or your purchase -- to one of the many markets where they will vacuum pack and ship it to your home. It doesn't get much better than home delivery! The Oregon Coast offers even more than great fishing. Don't worry if not everyone in your party loves to fish. There's plenty more to do on the Oregon Coast. You can rent a boat or enjoy crabbing, horseback riding, kite flying, beachcombing, scuba diving, cycling, windsurfing and surfing, whale and bird watching, and hiking through old growth forests overlooking the ocean. The list is endless. Coastal attractions also include lighthouses, aquariums, museums, theaters and festivals, poetry readings, casinos and state parks. The Oregon Department of Fish and Wildlife has a number of fish hatcheries that are open for visits. The Oregon Marine Board has more information on Boating in Oregon Coastal Waters. And check this site if you need an Oregon Boating License .